Let me start with a little incident of my past.When I was born I was diagnosed with jaundice.Doctors wanted to exchange my whole blood with a new one.They wanted 'Someone' to help me.That 'Someone' was also found.I was saved.Till now I dont know who that person is.There had been times when I pestered my mom asking about that 'Someone' but all in vain.I have always wanted to thank that 'Someone' in person.To tell him that I am incredibly grateful to give a second life to me.This led me thinking that a little noble act of us can bring a big change in 'Someone's' life(Butterfly effect). I also believe that by donating blood we can give someone what is truly ours and help them.So I promised myself that I would donate blood whenever I get a chance.I went to a camp after a long time,but was rejected at first as my hemoglobin level was 12.2 g as opposed to 12.5 g.They dint allow me to donate.They sent me back with a piece of advice to eat well.After 6 months I promised them that I would come again.And today was that day. I was so eager and walked inside the camp anticipating if I would be selected to donate.As soon I went in to check my hemoglobin, the person who was inside glanced at me suspiciously and asked my weight.I said 48 kg.Without thinking he said no.I was disappointed.Walked out with a heavy heart while a lady outside saw me and asked me to check the weight and said you are exactly 50 kg.But I was not 50 kg and I knew it.But I kept my mouth shut.If it was any other day I would have ofcourse disagreed with her.Surprisingly I was happy.Happy that I was gonna give blood.I passed my first test.The second test was waiting.I keenly noticed the screen which displayed my hemoglobin level.And there it was 12.6 g.I was flying.My dream came true at last.But still I worried a little.While I was lying on bed donating,my mind thrusted me with many scenarios that could possibly go wrong. But my heart was light.I could feel the calmness and a sense of satisfaction.I closed my eyes, took deep breaths and felt grateful.People around me were more concerned about me.They assured that it will be okay.Thanks to all of them.Thanks to my friend who accompanied me even though she was scared of blood. After donating I sat up,looked at my friend and smiled.I felt a satisfaction that could not be explained.The feel of giving can never be compared to anything.And I experienced it today.Hope I will donate blood once in every six months. 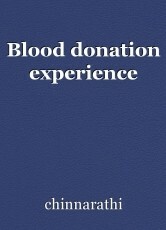 I really enjoyed reading about your experience donating blood. I was very eager to donate blood once, so as soon as I turned the minimum age I was there. I ended up fainting, which wasn't great, but I was still glad that I did it. As you say, there is a satisfaction to it; you've helped someone who really needs it. It's not something easy to do, it takes a lot of bravery. It's great that you had such a positive experience, and that you intend to go back.